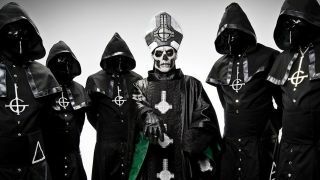 Mysterious Swedish outfit Ghost are preparing to replace frontman Papa Emeritus II, claims one of the Nameless Ghouls. And he alleges they’re considering a collaboration with bearded drag act and Eurovision Song Contest winner Conchita Wurst. The original lead character was exchanged ahead of the launch of second album Infestissumam, launched last year – although it’s widely believed the same person remained under a new outfit. Last night an unidentified band member told TeamRock at Sonisphere Finland: “There will definitely be a third; we’re looking into the options right now. We’re trying to work out who’s the best candidate. On a more serious note, the Ghoul said some groundwork has been done on their next studio project. “We have some track title figures out, and we know the album title too, as well as thematically where we’re heading. The Finnish edition of the Sonisphere festival took place yesterday in Helsinki, featuring Metallica, Slayer, Danzig, Mastodon, Ghost and Gojira. The UK edition will be held at Knebworth Park on July 4-6, headlined by Metallica, Iron Maiden and The Prodigy.